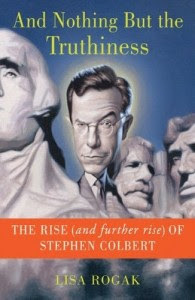 I just read And Nothing but the Truthiness: The Rise (and Further Rise) of Stephen Colbert . Colbert is just as smart as a whip and super interesting. This book explains where Stephen came from and how "Colbert" the persona emerged. It also talks about how he and Amy Sedaris collaborate on projects. Teaser: She lays on the couch. Here are some things I learned from this book: Colbert is the youngest of 11 kids. His father and 2 of his brothers died in a plane crash when he was 10 years old. The people who work at The Daily Show eat a lot of Lucky Charms. Colbert is a Sunday School teacher. He sings "I Want You to Want Me" to get psyched before his show. The only interview that really rattled him was Jane Fonda because she sat on his lap. He assumed "Bill O'Reilly" was an exaggerated persona just like "Stephen Colbert" is an exaggerated persona, but it's not. I think I need to read this book. Also on my to-do list this week is to eat Stephen Colbert's AmeriCone Dream ice cream. I think it will taste very truthy. Free Americone Dream on Feb. 14th at Ben and Jerry's stores!! His interview with Maurice Sendak has to be one of my favorites. Perfect on both sides. I'd buy the flag pole book. Now I have to read this book. The Maurice Sendak interview was glorious. Especially the part where he doesn't like adults OR children. Oh! The Colbert/Sendak video is so good I can't stand it. So glad you posted it. My friends all laugh that Steven Colbert is on My List but I just can't resist a man who is funny, smart and nice (I assume he's nice because douchebags don't usually teach Sunday School). 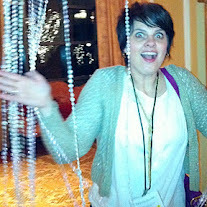 Plus, I really like Southerners. I think Hannah said Colbert is a jerk in real life. Of course she didn't spend any one-on-one time with him, but apparently most of the celebrities that go to Smithsonian things are jerky. Maybe they are just tired of traveling? I love Maurice Sendak. Heard him on Fresh Air a couple of months ago and almost cried. He's awesome. "Outside Over There" (which is in Ida's collection since of course, her name is Ida) freaks everyone out who reads it at my house. But what's not to love about goblins stealing your baby sister and leaving in its place another one all made of ice? I'm crying at that Maurice Sendak interview, it was so good. Please let Colbert be just as awesome in real life and not a complete jerk.